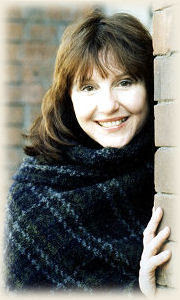 I am truly delighted to bring you an interview with the author of the fabulous novel Pope Joan, Donna Woolfolk Cross! Welcome to Passages to the Past and thank you so much for gracing our humble site! It's been a pleasure getting to know you and Pope Joan! Finding Inspiration: With some authors a character comes in a dream, some discover an interesting character while researching another…what was it that prompted you to write Joan’s story? I had already decided to make the leap from the books I had been writing (non-fiction books about words and language) to historical fiction--my favorite form of leisure reading. Then I happened to come across a passing reference that I originally thought was an amusing typo ("Joan" for "John"--an easy "slip of the pen"). But a few weeks later, I had to drive my daughter to the library for a school assignment. While waiting for her, I had time to kill. Idle curiosity led me over to the New Catholic Encyclopedia, just to check on that odd reference to a "Pope Joan". I didn't expect to find anything. So imagine my surprise when there WAS an entry for her! I stood in that library with my jaw dropped open. How was it possible that the story of such a remarkable woman had existed for centuries--and I hadn't even HEARD of her? I knew immediately that this was what I wanted to write about. In the book business, they call this a “drop-dead” story. I couldn't believe I'd had the enormous good fortune to stumble across it! Research: You referred to ancient texts for research – how do you find such information? How long was the research process for Pope Joan? Forever. Or so it seemed. It took so long that I had started to refer to the work as “my posthumous work”--for I began to think that I might end before it did! I spent over seven years researching and writing Pope Joan. Nothing mysterious about the process; I just slogged away, beginning with easy-to-access sources, readily available in U.S libraries--sometimes even from inter-library loan! From those I retrieved references and bibliography that led to harder-to-obtain sources available only in rare book rooms and special collections, often in other languages, sometimes in other countries. Fortunately, I can read French, Spanish, Italian, and some Latin, which was an enormous help. The Movie: Congratulations on Pope Joan becoming a big Hollywood movie! What has been the most exciting aspect of this project for you? Did you have much say in the screenplay? Was it hard to share “your baby” with the screenwriters? It took ten years to get “Pope Joan” to the silver screen. There were four different production companies, six different directors, and eight separate screenplays. The word “vicissitude” doesn’t begin to describe all that I went through. Best way to describe it is to say that I finally understand, for the first time in my life, why everyone in Hollywood is on crack cocaine! Constantin Film, the same production company that made “Name of the Rose” finished filming Pope Joan in January. Though I had no contractual rights with regard to the screenplay, they were generous enough to take many suggestions from me about the script-in-progress. I’ll be listed as “Creative Consultant” in the film credits. The most exciting part of the project was being on-set in Germany and Morocco. Fascinating! They had to drag me off the set at the end of each day’s shooting,. It was extraordinary to observe so many people--actors, cameramen, makeup people, extras, even animals--enacting scenes and pieces of dialogue that I remember writing in the solitude of my little study. Historical Accuracy: Given that there wasn’t a lot of information available, what historical liberties did you take with Pope Joan? You are certainly right about about there not being a lot of information available about Joan. But that’s not surprising. The lives of ALL of the 8th and 9th century Popes are told in exactly the same way-- -in very abbreviated form. Chronicle records in the "Darkest of the Dark Ages" were written with uncertain ink on nubbly animal skin (for that's what parchment is). They were short and woefully lacking in detail. If you took one of these papal records off the hand-written page, it wouldn't take up more than about 15 pages of modern print. So all I had was a skeleton of a story. That’s the beauty of writing historical fiction--it allowed me to put flesh on those dry old bones, to give this inspirational story laughter, smiles, tears--all the things that make a story human. I tried, however, always to base my "imaginative leaps" on what might reasonably be deduced from the evidence at hand. And the details of the ninth-century setting, strange and savage as they now seem, are all factual. Future Novels: Are you working on a new novel at the present time? What can readers look for in the future from Donna Woolfolk Cross? I'm writing about another strong woman from history, this time from 17th century France. I admire her very much, as I do Joan. What draws me to both women is best expressed with a quote from George Bernard Shaw: "Reasonable people adapt themselves to the world. Unreasonable people persist in trying to adapt the world to themselves. Therefore, all progress depends on unreasonable people." (n.b. Shaw actually spoke of "reasonable and unreasonable men"; I've altered this to make it inclusive of women). In this complimentary sense of the word, Joan was certainly an "unreasonable" woman. So is my next heroine--whose name, I'm sure you've noticed, I have artfully not mentioned (largely because my agent has told me she'll cut out my tongue if I do!). I hope my readers will enjoy my next heroine’s delicious "unreasonableness" as much as I do. “La Vie Quotidienne au Marais au XVIIe Siecle”--in other words, “Daily Life in the Marais in the 17th Century.” Research for my next novel--but actually more interesting than one might think! What an excruciating question! I have so many more than five--all writers of historical fiction, the best of all reading adventures, for it combines pleasure with learning--an unbeatable combination! Forced to the task, however, I’ll provide the names that pop into my mind first: Mary Renault, Cecelia Holland, Gore Vidal, Zoe Oldenbourg, Judith Merkle Riley. Also a wonderful up-and-comer: C.W. Gortner. So many books changed my life--made me literate; introduced me to other cultures and different ways of “conjuring the world”; helped me become more tolerant and broad-minded; taught me history I had never learned in school. At every stage of my life, there was a book that changed me and influenced my life choices. But as you’ve put my foot to the fire, I guess I’d have to say “A Room of One’s Own” by Virginia Woolf--a book that made me realize how important it is to for a woman to secure an education--and with it, economic independence, upon which all true choices depend. “Isn’t it pretty to think so?” from “The Sun Also Rises” by Ernest Hemingway. A line filled with romantic yearning but also skepticism born of experience--a combination that I understand and am moved by. I really enjoyed reading what Donna Woolfolk Cross had to say about her research as this area has always intrigued me in regards to writers and their stories. How crazy and how great that she kept up with her research for seven years to give us a book that I am hearing such great things. I am now more psyched to read Pope Joan. This was fascinating. Thank you so much for posting this interview. I can't wait for the movie! Great interview! I'm reading Pope Joan right now...how did I miss it when it first came out?? What a great interview! This book has been on my TBR pile for too long, I definitely have to read it! Preferably before I see the movie. It's really interesting to learn about the writing process, and now I am very curious about the next book! Great interview! I can't wait to read the book AND watch the movie. Thanks! Hi, Everyone! Donna Woolfolk Cross here, writing to thank you for the nice comments about my interview with Amy. 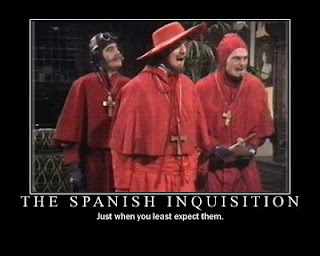 She's terrific; gotta love a woman who posts a picture of the Monty Python Spanish Inquisition after I call her "Torquemada"! I note that several of you have said you just bought a copy of Pope Joan. If it's the Three Rivers Press/Crown Publishing edition (and it probably is, for that's the one now in bookstores, just released on June 9th), then you're eligible to enter the "Walk the Red Carpet" contest. It's a quirky marketing idea that I came up with: a chance to join me at the U.S. premiere of the movie version of Pope Joan. Details can be found at http://popejoan.com/2009promo.htm. Would be great to meet one of you there! Thanks to all of you, and especially to Amy, for her support of historical fiction. Readers like you make all the long hard effort of book creation worthwhile! I hadn't realized that "Pope Joan" was going to be a movie. I'll definitely be on the lookout for that, since I enjoyed the book. Thanks for a great interview! Great interview -- and yes, tough questions! I definitely will be looking for the movie. This was a great interview. I had only just learned who Pope Joan was a couple of months ago in my Women's Lit class. I haven't been able to read this book yet but it sounds great. I didn't know there was a movie, awesome! Wonderful interview - I love the Shaw quote! Will have to post it on the wall by my desk. Fantastic interview! Can't wait to read the book.